By way of stoking the inspirational fires I have been (re)reading Defeat in Detail - The Ottoman Army in the Balkan Wars 1912 to 1913 by Edward Erickson and it is certainly hitting the spot in terms of being thought provoking. My initial plan was to build, in effect, reinforced DBA sized armies and to an extent this still holds good. The biggest difference now though is that I am looking at 16 figure battalions rather than 12. The rationale behind this is very simple - they look better! Seriously though, using the figures individually based on the 2 x 2 bases from Warbases the battalions have a little more 'substance'. I will also be looking at having four such units per side (64 figures) which breaks down quite nicely into eight units of eight figures for which I have a cunning, Morschauser/Battle Cry related plan. Warbases are happy to cut bespoke bases and so I shall avail myself of some of these for the collection, for example, for use by command groups etc. Originally I was merely going to paint the figures bases green but as I shall be using flocked Hexon tiles I will need to add this to the models. This will be my sole concession to artistic endeavour! This lot will be still be painted in an 'old toy soldier' style as the uniforms in 1912 still retained some pretty colourful and unusual types - the Turks certainly still had reservists in the old dark blue uniform and the Bulgarians had a real mish mash of kit behind the more modern looking 'patroned' regiments. I plan to add a cavalry regiment - of twelve figures - to each force with artillery and MGs to taste. The resultant forces will be sufficient for the small scale representational games I shall be playing and the rules I will be using. Upon my return from the Mediterranean I plan to order in the requisite additional figures from Irregular Miniatures - this will be the Greeks, Serbs and Montenegrins, together with the additional Russians I shall be using for the Bulgarians. The entire collection will probably weigh in at around some 400 figures or so which is not too onerous considering that will mean in effect 5 armies. The Montenegrins will be smaller than the others and will not have any cavalry either. 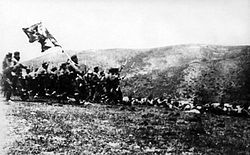 The Naval side though will not be touched until at least a matched pair of Balkan armies have been readied - originally, in the 1900 guise this was to be the Greeks and Turks but now, for 1912, the Bulgarians will feature instead of the Hellenic army. I think I should qualify my apparent about face from a 1900 hypothetical set up to an actual 1912 version. The latter was always my first choice but I got really hung up about the Bulgarian infantry uniform and the apparent difficulty in tackling the naval side from a scratch building perspective. Initially I really did not fancy attempting this as I thought it would be way too difficult but am now far better prepared to take on such a project by virtue the model making experience accrued during the ACW ship building project. I have the fleets in 1/3000th in any event but want the models in a larger size - they are much nicer to game with. A destroyer that is 180 ft long does not look particularly imposing in 1/3000th but for my plans these will be around 1 3/4" - much more usable! Now that these two potential problems have been addressed/alleviated to a certain extent (at least psychologically) my mind can now rest easy and focus on that which it should have been doing so from the outset - The Balkans, 1912/13.